The purpose of this article is to describe my experience of an International Volunteer Project so that well-intentioned potential volunteers will have some idea of the kind of conditions they may face. Service Civil International (SCI), the organisation that promoted the project describes itself as: “an international non-governmental organisation committed to the promotion of peace and understanding through voluntary activities. These activities consist primarily of 2-3 week long international volunteer placements involving volunteers from all over the world. These projects range from working with marginalised people to ecological, arts and cultural projects, amongst others.” The Irish branch of Service Civil International is called Voluntary Service International (VSI). In my job I get four weeks of annual leave each year. This year I decided to spend two of those weeks participating in an SCI International Volunteer Project. 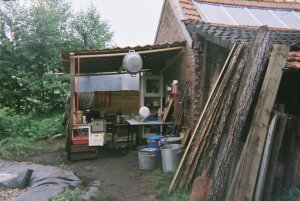 After perusing the project booklet and considering various options, I plumped for a project (or workcamp) called “Othala” in the village of Weenermoor in the North West of Germany, near the Dutch border. Othala is a small farm project with a garden, an orchard and a Mongolian yurt (tent) founded as a place for experiencing a self-sustaining lifestyle. Othala invites volunteers to live as self-sustainable as possible and become conscious about how our normal life is organised and where food, energy and shelter come from. Vols will be involved in gardening (organic and herb garden, orchard), baking bread, renovation and reconstruction of the buildings with loam and straw, local contacts with other farms. Simple accom in tents, yurt or in the house on straw. Some knowledge of the skills may be useful. No alcohol. This brief description, supplied to VSI by the German branch, is all the information that the potential volunteer gets before applying. Application involves paying a €105 participation fee and making a commitment to participate fully not only in the project itself but also in the preparation and evaluation workshops run by VSI in Ireland. Therefore it is obviously very important that the description be accurate and honest. Unfortunately there were quite a few gaps and errors. First and foremost, Othala is not a farm. The property consists of a fairly dilapidated, partially refurbished farmhouse with a long but not very productive garden. The couple who own it (the founders) moved in in November 2005. There was no orchard. There was a plum tree growing in the neighbour's garden but the plums on it did not ripen during the two weeks of the camp. There was hardly any gardening work to do except to collect salad leaves from the garden, enough work for one person for less than one hour each day. Most of the working time was spent on the following projects: construction of a clay oven, construction of a solar food drier, cooking in the small, outdoor kitchen, replacing roof tiles of a shed and various works to the house including painting, ivy removal and mounting of insulation. Off the property, there was the opportunity for pairs of volunteers to work on two organic farms and in a health-food store. Washing facilities included two large enamel bowls filled from a jerry can or hosepipe or if you were really lucky, from a pot of warm water, heated on the same little woodstove that was used for cooking. Until sickness struck, the hosts requested that the bowl of water for hand-washing not be emptied after each person, so as to conserve water. 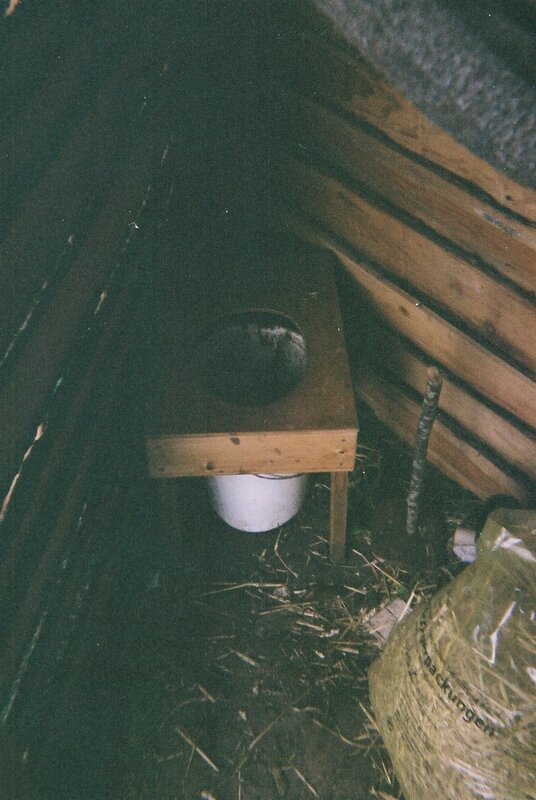 The shower cubicle (pictured) was a makeshift arrangement of offcut timber boards and polythene sheeting. You stood on a pallet and hosed yourself down with cold water. Bracing! The toilets were a crude variety of compost-toilet. A wooden frame provided a seat over a plastic bucket. The urine and faeces were separated. You covered your faeces with two paper towels and then pressed down on it with a piece of wood. The paper towels were supposed to keep the flies away. They didn't. When the bucket was filled, faeces was dumped on a heap and covered with straw and leaves. The urine was emptied down the flush toilet in the house. My understanding is that SCI projects work on the basis of an exchange. You pay a participation fee and work for a few hours per day and in return you are provided with food and accommodation as well as the opportunity to meet like-minded people from all over the world. While I was prepared for the fact that I would be sleeping in a tent for the two weeks, nothing prepared me for the food situation, not even the preparation workshop run by VSI in Dublin. In the camp information sheet, which I received two months after sending in my application fee, it was mentioned that the food would be vegan (no meat, fish, eggs, dairy, honey or any other animal products). This did not perturb me as I eat a mainly vegetarian diet and know that I could live on vegan food for two weeks. What did perturb me when I arrived at Othala was discovering that most of the fruit and vegetables that we would be eating would be coming from the waste container of two local supermarkets. Granted, some of it was in reasonable condition. Very ripe, but edible. Some of it was not in a reasonable condition, i.e. mouldy or starting to decay. Never mind. It went into the soup anyway. On one occasion, a young volunteer cut the mouldy bit off a tomato only to hear one of the hosts tell her to use it. In fairness to the volunteers who worked in the kitchen, I have to say that the taste of the dishes served usually belied the very humble origin of the ingredients. My concern, however, related not to the taste but to the safety and nutritional quality of the food, a point that seemed to be lost on some people when I raised the issue, including certain of the camp hosts and leaders. Whether that misunderstanding was deliberate or not I do not know but they did understand English well. Oh, well, never mind the fruit and veg. At least we had those great vegan standbys, peanut butter and tahini (sesame seed paste). Or did we? Well, yes, in limited quantities. We were actually asked to spread them thinly and warned that they might run out! What particularly annoyed me was that peanut butter and tahini are about half the price over there that they are here in Ireland. The fact that this year is the first year that a work camp was hosted in Othala goes some way towards explaining the practical difficulties we encountered. However, I would have to say that in my opinion, the hosts were idealistic to the point of irresponsibility. The bread situation illustrates this amply. A certain number of loaves of (organic) bread had been purchased by the hosts. The bread that was to feed us during the latter part of the camp was to be made out of flour that had yet to be milled and baked in a clay oven that had yet to be built. The grains had been purchased and were milled into flour on the first Monday of the camp. This was actually very interesting. All fourteen of us, hosts, leaders and volunteers, got on our bikes and cycled to the windmill in a nearby town. The bags of grain were taken on a bicycle trailer. We got a tour of the mill, given by the miller and then we watched as the grain was ground between rotating millstones. The miller mentioned that as time had passed, his mill was being used less and less. It is now used regularly by only one farmer, who gets grain milled to feed his livestock. So it had been some time since the mill was used to make flour for human consumption. The following week, we found out why. Sandy bread. In order to make flour fine enough to make bread, the millstones had to be moved closer together and the grain had to be passed through twice. So tiny particles of millstone ended up in the bread. A great source of minerals, I'm sure, but not pleasant to eat. I found it strange how none of the hosts or leaders noticed it until I mentioned it. Group dynamics, perhaps. The clay oven mentioned above didn't get finished due to inclement weather. At least we had fun standing in troughs of mud, mixing the clay and sand with our feet. Luckily nobody was cut by the large shard of glass that appeared in the mixture one day! In the end, an alternative source of bread was found. A local baker agreed give us bread which had not been sold. There was some debate about whether or not we should actually accept this offer (as the bread wasn't organic) but common sense prevailed in the end. It will come as no surprise to readers that everyone suffered some kind of digestive ailment, particularly during the second week. The combination of poor sanitation, nutritional deficiencies and tiredness proved too much for our guts. Suffice to say that the lucky ones only had frequent trips to the toilet. After having called a doctor for advice, the hosts reminded us of the importance of washing our hands and told us to use clean water each time we did. Apparently he had also told them that this kind of situation is normal! So why didn't I just leave? An excellent question and one that I asked myself more than once. One of the successes of the camp was that the group of volunteers from the USA, England, Germany, Italy, Japan, Tajikistan, Sweden, Switzerland and Ireland got along very well together, in spite of the fact that not everyone had a great command of English. I felt that I didn't want to leave early because I didn't want to leave the group. I also wanted to see if things would improve as time went on. Another thing that helped me stay the distance was the plan I had to write this article – it gave me a kind of detached curiosity about my own situation without which I would have felt less calm than I did. And in spite of all that I have written above, there were days that I really enjoyed. I was one of the few volunteers who had the opportunity to work on a real farm in the area. I spend the two days packing potatoes or working on top of a potato harvester. The farmer and his family were friendly and we chatted during lunch and tea breaks. The lunches were excellent and we left with a bag of spuds each. We were also taken as passengers in the machinery so we could watch the farmer and an apprentice harvest wheat, which was a new experience for both of us. The pair of volunteers who worked on the other farm were also well looked after and brought out sight-seeing during the week-end. During that week-end I joined a small group who made a day-trip to the Dutch city of Groningen. The weather was beautiful. We wandered around, slept in the sun, bought postcards and ate in restaurants. 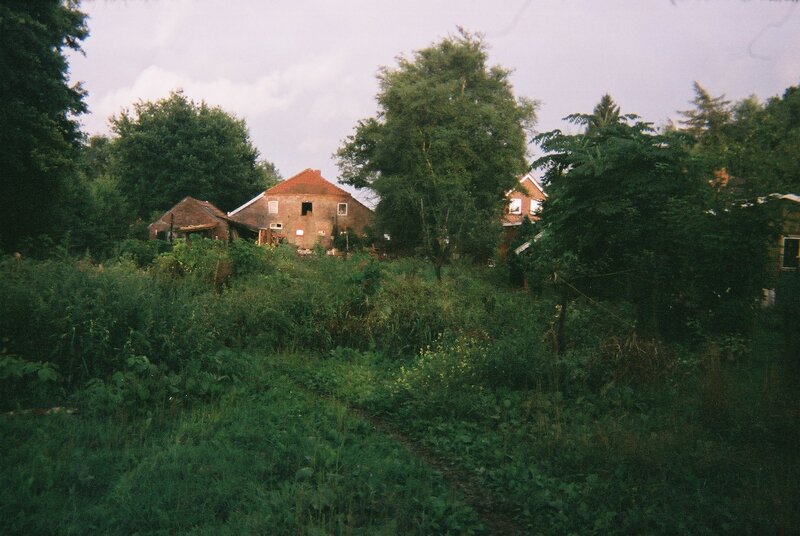 The following day I cycled to the nearby town of Weener with another volunteer. We explored along the canal and had dinner in a Thai restaurant. It was a nice restaurant but they didn't cook pad-thai, which is a bit unusual. There were educational workshops run by friends of the hosts every day during the first week including felt-making, which I enjoyed. There was also an enlightening talk about money, covering Local Exchange Trading Systems and the effect that the charging of interest has in an economy. During the last three days at the camp things improved. We had enough bread and peanut butter. One of the hosts, a musician, played music and we had a sing-song in the yurt on a couple of nights. There were some spontaneous drumming sessions. But I was still relieved when it was over. I suspect that the hosts were too. I found this article really interesting. I've always wondered whether these holidays were properly regulated in terms of checking the veracity of the descriptions provided and matching people's skills to the right situations. It doesn't seem to me that VSI does its homework if this is anything to go by. 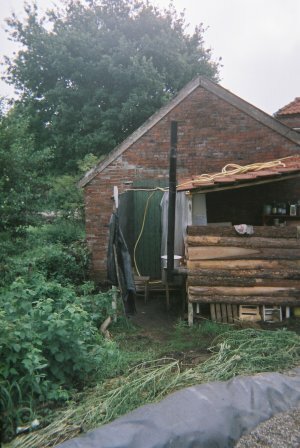 The photographs of the bathroom facilities, in particular, are pretty stomach churning, though the house and landscape look as if they have a lot of potential. They should probably have advertised for volunteer plumbers rather than farmworkers. Well done on the account - I'm sure it'll prove useful to many people, particularly in these days of rising 'ethical tourism' and volunteer holidays, where there are bound to be some dud operators who exploit people's goodwill (though in this situation it sounds more amateurish than consciously exploitative). The account is pretty balanced in its assessment and is kind where I wouldn't have been. I don't think there's any excuse for getting people into a situation where they're risking illness unless they consciously choose that they're going to take such risks. There's no nobility in that form of living when it can be easily avoided - most people I've come across involved in sustainable living are not subjecting themselves, or more importantly others, to these types of conditions. I'm glad you had some good times, though. Fascinating and well-written article. It's interesting to hear about the health troubles the volunteers suffered when one of the main reasons for these types of projects is to improve the health of the planet and its people. I think the scale and over-ambition of this project and others like it is part of their downfall. It seems to me that it might be better to slowly and gradually foster a more sustainable relationship with our food. For example, begin by planting some herbs on the window sill and trying out some fair trade products from the amnesty, trócaire or oxfam shop. In general I'm pretty sceptical about eco-tourism. The destination in this article was European, but I'm suspicious if the package involves a long haul flight to a developing country. My understanding is that it would be better to give the price of your 'holiday' directly to the project so they could employ local people living there and save carbon emissions from the flight fuel. I'd be interested in hearing about any positive examples of eco-holidays as they often seem more about making the traveller feel better than really helping the environment. Indeed, this is a really interesting article and a very good choice to make the features page. Well done David and Indymedia. Thanks David for writing about your experience, and Indymedia editors for featuring it here. It speaks to the difficulties of trying to so many things: From the honesty and naivete of people trying to make radical change to a sustainable lifestyle (asap!! ), to the possible abuse of volunteer good-will and European volunteer programs for personal/private projects. A recent article I read in the Guardian or somewhere like that about "Gap year volunteering" as a kind of imperialism (e.g. PDF research paper: http://www.gapyearresearch.org/TomMA.pdf). Obviously not the case in Ireland-Germany volunteer exchanges, but still an issue in the whole international youth volunteering world. Another thing was this article in CounterPunch or ZMag by a sub-editor for some publishing house who do books by Noam Chomsky. She complained that Chomsky spends 99.9% of his book talking about how things are (i.e. what's wrong in the world), and perhaps one or two pages max on solutions. It's always harder to figure out the solutions. It's an exploration, a journey. Thanks again David for sharing your journey with us! I have done two workcamps abroad through VSI. The first was everything I'd hoped it would be, and more. The second was closer to the one described abroad. Both times, on my return I participated in the evaluation with volunteers from other workcamps. The large majority of them were happy with their camp. Both times, most of the other volunteers on my camp had done several workcamps previously, and generally found them positive experiences. My partner has done about half a dozen workcamps through the SCI affiliate in his native country. He would also say that most of them have been very good, with a couple exceptions (one of which, incidentally, was a German camp). The SCI affiliates only co-ordinate the camps, they don't organise them, and this lack of complete control inevitably allows the occasional abuse to occur. I'm not sure what exactly can be done to prevent them, but in my (and my partner's) experience the SCI affiliates do take action when abuses are reported to them and, if they do not receive reassurances from the affiliate in the host country, they will stop sending volunteers to workcamps co-ordinated by that affiliate. It would be a shame if anyone who'd been thinking of doing a VSI camp was put off by the above account. If I'd heard myself complaining about the last camp I did, I'd probably be put off myself... but I know most of them aren't like that. One thing I found particularly interesting about David's experience was the idea of feeding yourself on the waste discarded by a supermarket. Throughout the world, a process of urbanisation has been in progress since the industrial revolution. 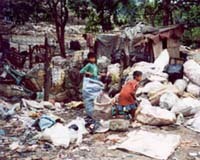 These days, in the global South, a huge movement of poor people from the countryside to cities is continuing. These people usually live in 'shanty towns' made up of self-built housing, and get whatever jobs they can. Failing that, many of them live from the rubbish discarded by those higher up in the social order. It is amazing that the lifestyles and patterns of consumption of some of the world's citizens are so wasteful that people can live off what we throw away. I'm sure it wasn't pleasant to have to eat rotting food, particularly when you've paid for the privilege!! But it's an interesting idea to try to make use of what has been discarded. I'd imagine it put you in touch with just how privileged most of us are, even to be able to have access to this here internet thingy. I know there are some in Ireland who forage for discarded food, including some Food Not Bombs activists. I think it's a great way to illustrate the ridiculousness of the huge material disparities between different sections of the world's population. From both an environmental and a human point of view, there's no sense in living the way we do... but we're all caught up in it. First paragraph should end "described ABOVE" not "described ABROAD". Told you I was sleepy. I think it's ethically commendable to try to use what would otherwise be wasted. Mostly, though, this doesn't have to involve foraging in bins for half-eaten mouldy food - nobody should have to do this (though I know there are situations where people do have to). Any good sustainable project should probably be at the stage of growing its own food fairly early in the day anyway. Recently, I read about a successful scheme in the UK where homeless people (who partake of their own accord) are taught furniture resoration skills in live-in scenarios; the furniture is just rescued from dumps. Apparently the restored furniture is walking out of the shops - people love it. It's often very high quality and just needs a bit of work. You can use 'waste' and still have something beautiful; squalour and rotten conditions and bad 1970s decor don't even have to come into it. In this case people are also being taught a skill that helps them out of squalour. I have worked voluntarily with VSI in the past and supported volunteers who stayed in Irish short term projects, as well as going to work with a VSI project abroad. I'm sorry to hear about David's experiences, as mine were so positive. At my work project, we used to have a morning meeting where available work was offered to us. We chose the tasks we wished to do. 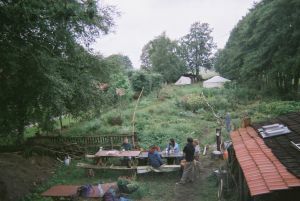 Accommodation was good, food often donated or grown at camp, but always wholesome and fresh. It was a long-standing, well-recognised project, though. *All projects in Ireland are voted on by VSI. One of the criteria is that the project is not for individual gain, but actually makes a difference to the community, or to a charitable organisation. *All feedback by volunteers is listened to, so please feed it back to VSI and SCI. *SCI encourages eco-friendly travel, lift-sharing, etc. I hope that this does not discourage anybody from taking part in a project. *Deirdre, check out Sunflower Recycling's new shop in Summerhill (Busybees ? Can't remember the name) and the SWITCH (Saving Waste IT Can Help) Project.